F&W gave hypertalented chef David Chang a few Thanksgiving leftovers—turkey, green beans, mashed potatoes—and he turned them into dazzling recipes. When Food & Wine asked Dave Chang for a Thanksgiving story, he blanked. 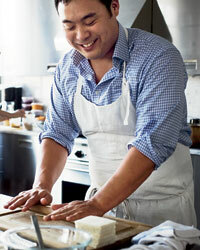 Dave is the force behind New York City’s Momofuku restaurants; he was named an F&W Best New Chef 2006 for his wildly innovative, Asian-ish American food. I acquired a good working knowledge of Dave’s cantankerous mind when we wrote the Momofuku cookbook, and I was sure he’d want to do something uncompromising. I know, for example, that his mom makes Stove Top stuffing, so a Korean-American Chang family Thanksgiving was not going to fly. But Dave does know turkey. Last November, one of his favorite farmers had 40 extra birds, so Dave bought them, and the Momofuku cooks had a Thanksgiving-themed competition, inventing dishes like an unctuous and ugly confit turkey neck. For F&W, Dave decided to take another Thanksgiving challenge by improvising a Momofuku-style feast from basic leftovers. First, Dave turned mashed potatoes and green beans into a crispy canapé, a salute to the 1950s. His inspiration for the turkey was Hainanese chicken, an Asian comfort food. He braised leg meat in a soy–and–brown sugar barbecue sauce, then used the rendered fat to flavor a rice that became so luxurious, it was probably the day’s best dish. For dessert, he drafted pastry chef Christina Tosi, who turned sweet potatoes into a garnish for a crazy-delicious brown butter pie. When Dave made the recipes for the F&W photo shoot, he surprised himself with how good the food was. And F&W’s editors can’t wait until the day after Thanksgiving to make this all happen again.